God Bless America Assisted Opening Pocket Knife - 3Cr13 Stainless Steel Blade, 3D Artwork, Aluminum Handle, Pocket Clip - BOGO | BUDK.com - Knives & Swords At The Lowest Prices! 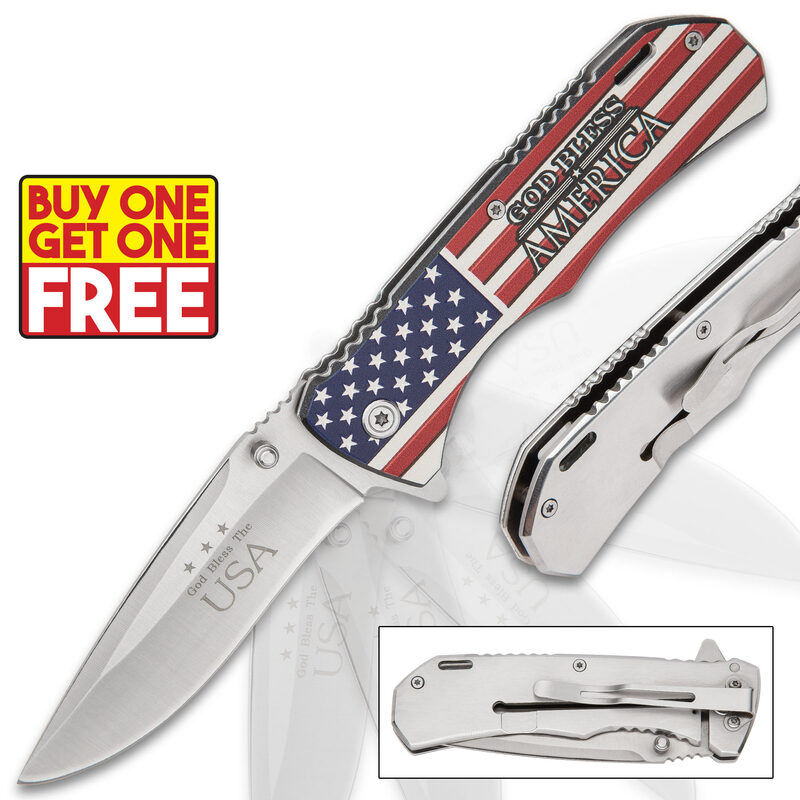 The best thing of all is that you get two of these awesome patriotic pocket knives! Our God Bless America Assisted Opening Pocket Knife has a classic vintage look that collectors of patriotic memorabilia will appreciate. Not just a collectible, it is fully-functional with its 3 1/2” 3Cr13 stainless steel blade with “God Bless the USA” etched on it. Quickly deploy the blade with the thumbstuds or flipper to activate the assisted opening mechanism. The aluminum handle and scales have jimping sections along them and one side of the handle features 3D artwork with “God Bless America” on a vintage-look American flag background. The assisted opening pocket knife is 4 1/2” when it’s closed and has a sturdy metal pocket clip for ease of carry. The best thing of all is that you get two of these awesome patriotic pocket knives!